What better way to kick of Four Fabulous Freebie Fridays than with not one, but two prizes up for grabs from my very generous sponsor, Karen from Be Design Solutions. If you are planning a little celebration in the near future then you are going to love this little printable set for your next shindig. 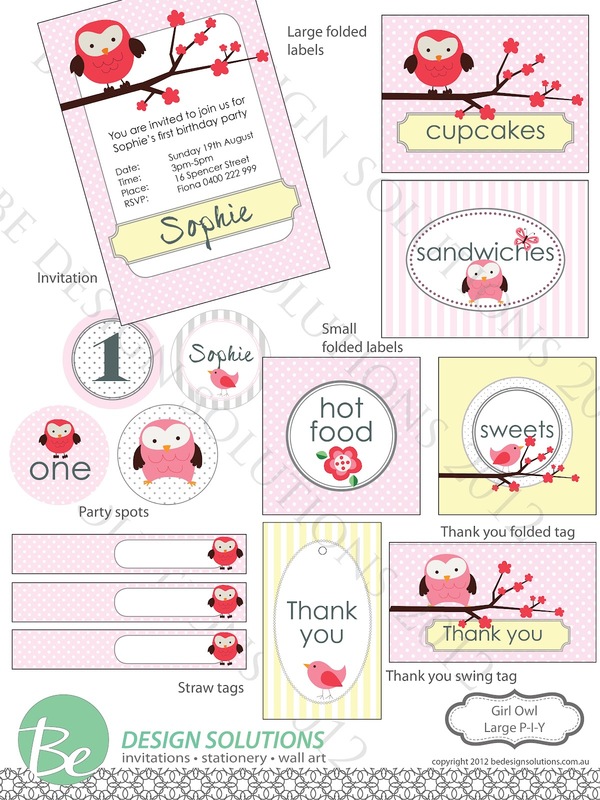 This sweet little owl design comes in the perfect pink and the beautiful blue illustrated above. It would be divine customised for a baby shower, christening, 1st birthday celebration or a party for any age really! 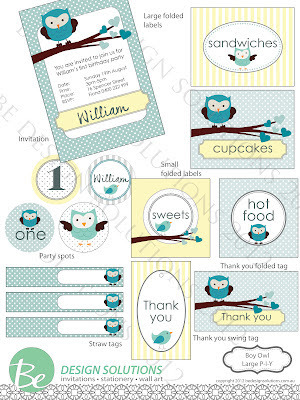 I adore this design and actually had an owl themed baby shower myself, so I am truly such a fan of this theme. We have my gorgeous daughters Christening coming up in November! These would be just lovely and match her bedroom theme too! 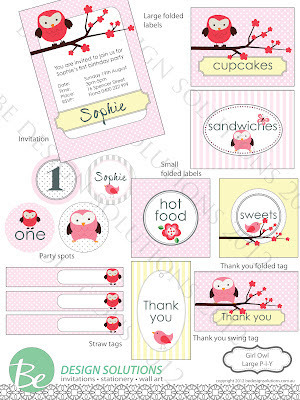 Ooooooh I just love anything with owls, they are just soooo cute!! I have both of my daughters birthdays next month so the timing would be perfect if I won. Thanks for a great giveaway! I have both of my girls birthdays coming up and love these! What a gorgeous giveaway! Now you've got my mine racing over what food I could do to theme with these gorgeous printables. 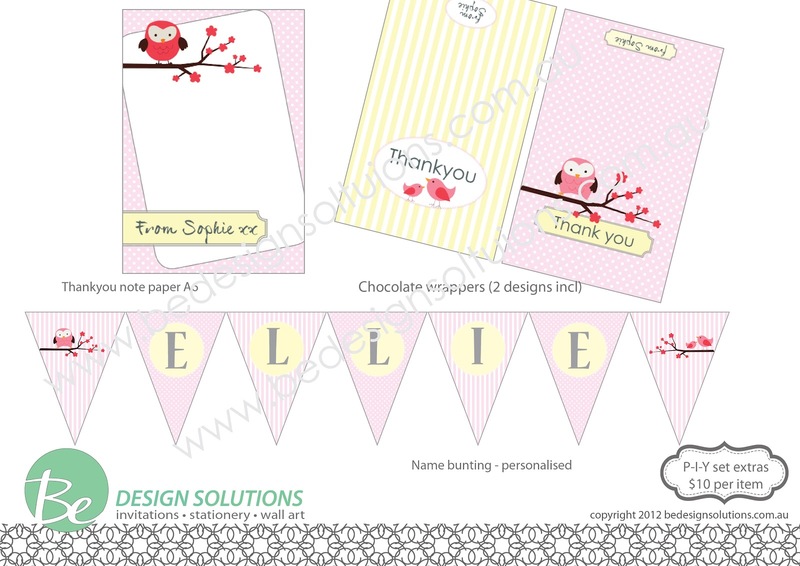 Love the Owl theme which would be perfect for my four year old daughters birthday in April next year. 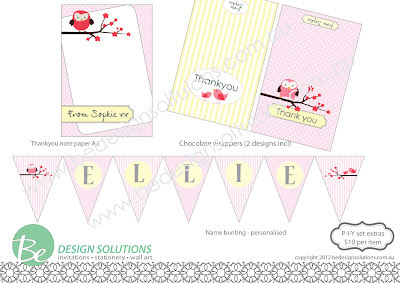 Will match her bedroom tree and owl theme. I have my daughter's 3rd birthday and son's 1st birthday parties all within 2 weeks of each other...and all in December!!!! What a hectic time of year this is going to be for our little family from now on!!! They are divine! Perfect for our daughters first birthday (in April). hoot hoot! We love owls! Birthday parties, anniversaries, and an end-of-school-year celebration. Thank you for promoting this great competition. I'm planning my annual 'drop-in day' for friends and family - from 10 am - 6 pm folk are invited to drop by, for morning tea, lunch, afternoon tea, or stay all day if you wish! I have a hens to organise and these look like cute. We are all kids at heart. Loving your blog! My darling one and only daughter is pregnant.. Im going to be a nana! hehe.. Baby shower coming up really soon, these would be perfect! Oh my daughters 9th birthday! She loves owls!!! ANd I ow a patisserie so it will go great together. I have my daughters 2nd Birthday in March. These would be perfect. Love them. I have a little girl turning 4 soon and I also have a niece that will be 1 soon, these would be perfect. So so would love to win the invites etc. My little girl is turning four and her whole bedroom is done out in owls we love them. Also she is the third girl so gets the hand me downs so would be nice to have something special lime this for her party.